The condominiums at Amelia South offer everything beautiful Amelia Island has to offer, complete with the comforts of home. Select from any of these condo rentals to enjoy a beachside pool, the beach in the back yard, and all the best Florida has to offer. Walk to everything, from shops, to restaurants, to beaches, to historic sites around the island, enjoying the feel of the ocean air. When each of these vacation rentals comes with a washer, dryer, dishwasher, disposal, ice-maker refrigerator, sleeping for up to six, two bathrooms, and a full kitchen, getting a piece of home while on vacation becomes a breeze. Amelia Island is a popular vacation destination simply for its beauty. Resting on the ocean, this area has a number of different activities to offer everyone, from a Pirate’s Playground, historic forts, and cemeteries to gorgeous scenic beaches and golf courses. Take a chartered fishing trip for some fishing excitement or enjoy a day on the back nine. Ride horses along the beach or fish off the pier. Search for shells and build sandcastles all day with the family. No matter what you enjoy, Amelia Island will serve you. The island itself is rich with dramatic history and beautiful nature. It includes nature preserves both in and out of the water, where visitors take guided tours and learn more about Florida’s natural offerings. The Amelia Island Welcome Center helps thousands of people plan their outings every year, with information and facts on many island activities. The fort at Fort Clinch State Park offers history and links to the past that intrigue hundreds each year, complete with Civil War battle reenactments. Those looking for a calm day of shark tooth hunting flock to the beaches here, where teeth are quick to find, and shells are plentiful. Families enjoy days on the beach, where the surf rolls in, the kids swim, and the parents enjoy the calming sounds of the ocean. When a family or a group of friends visits Amelia Island, they often stay at Amelia South condominiums for lodging. There are two and three bedroom options available, depending on your specific needs. All condos are fully furnished, so only worry about bringing along your personal essentials. Every unit includes a balcony which overlooks the beachside swimming pool and the ocean. Bring the binoculars for some fascinating aquatic animal watching from the comfort of your own home. Relax on the balcony as the soothing ocean sounds and smells roll over you, rejuvenating and revitalizing you. 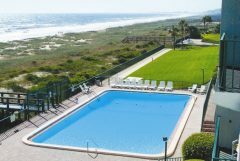 Amelia South, parented by ERA Real Estate – Fernandina Beach Realty, offers only the best vacation rentals for families, groups of friends, or anyone needing a beach getaway. Rent one of our condos today or stop by for a tour, and find out how relaxing daily beach viewing can become. Unwind in a natural home setting, after enjoying yourself at any one of Amelia Island’s many fun activities. With everything Amelia Island offers, there is no excuse to not visit today. If there are any questions do not hesitate to contact us via e-mail or by phone at (904) 261-6795 or (800) 335-0984. Guests may begin to check-in at 4:00 p.m. on their arrival date. When considering renting or selling your Amelia Island vacation home, you should work with a vacation rental company that you can trust. Ready to find out what your home could rent for?